Livingstone Online is delighted to announce the publication of a major critical edition of Livingstone’s Missionary Travels Manuscript (1857). Missionary Travels and Researches in South Africa is the result of Livingstone’s sixteen years’ residence in south-central Africa and his celebrated transcontinental journey from Angola to Mozambique between 1852 and 1856. The book is also Livingstone’s major literary accomplishment. It serves as the primary statement of both his personal objectives and his theories about the future prospects of southern Africa. Following publication, the book became one of the most influential works on Africa in the mid-Victorian period. David Livingstone – Lake Ngami (Painted Magic Lantern Slide) . Copyright National Library of Scotland. Creative Commons Share-alike 2.5 UK: Scotland. 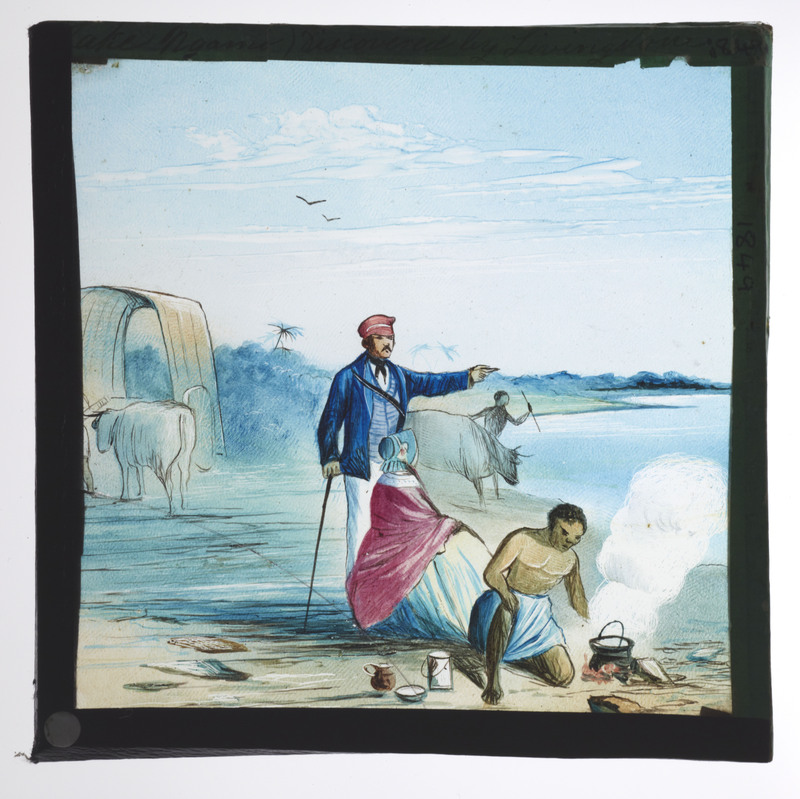 This slide depicts David and Mary Livingstone with an African attendant, at Lake Ngami in 1850 following their journey across the Kalahari Desert. The artist deploys familiar nineteenth-century racial stereotypes to represent the attendant, while portraying the Livingstones in an idealised domestic scene designed to appeal to the Victorian public. The lakeside tableau is based on an illustration published in Missionary Travels (Livingstone 1857:opposite 66). Livingstone Online’s newest edition offers unique insight into the creation of Livingstone’s bestselling book by focusing on the literary manuscript of Missionary Travels. This manuscript – which consists of over 1,100 handwritten pages – has never before been published, but is now made publicly available in the form of digital images and critically encoded transcriptions. The Missionary Travels manuscript captures a key moment in the book’s development by revealing how Livingstone and his publisher, John Murray III, transformed the experiences of the field into a polished narrative of exploration for public circulation. The numerous instances of correction and redaction across the manuscript’s three volumes provide critical evidence of the composition, revision, and editorial practices that shaped the book as it was prepared for publication. 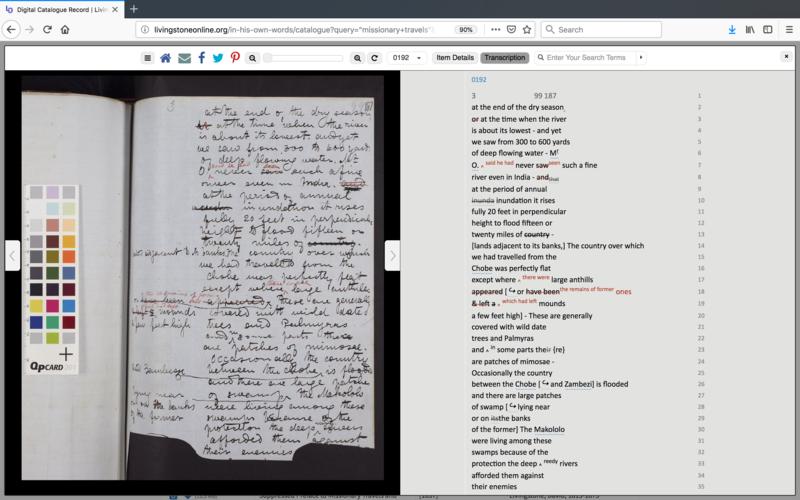 A screenshot of Livingstone Online’s manuscript viewer, showing a manuscript page and transcription from the Missionary Travels edition. Copyright Livingstone Online. Creative Commons Attribution-NonCommercial 3.0 Unported. This sample of the manuscript demonstrates some of its distinctive features, including marginal additions, deletions, overwriting, and correction by an editor in red ink. The transcription of this page demonstrates the various modes of display developed to represent these features on the screen. “Livingstone’s Missionary Travels Manuscript (1857): A Critical Edition” was made possible by the generous provision of manuscript images from key archival repositories: the National Library of Scotland (Edinburgh, Scotland), the David Livingstone Centre (Blantyre, Scotland), and the Brenthurst Library (Johannesburg, South Africa). The project directors (Justin D. Livingstone and Adrian S. Wisnicki) are grateful to these institutions and to the various funding bodies that provided financial support. The National Trust for Scotland’s David Livingstone 200 initiative (2013), the Marc Fitch Fund (2014), the Strathmartine Trust (2016), and the Modern Humanities Research Association (2016) all awarded grants that funded crucial phases of development. 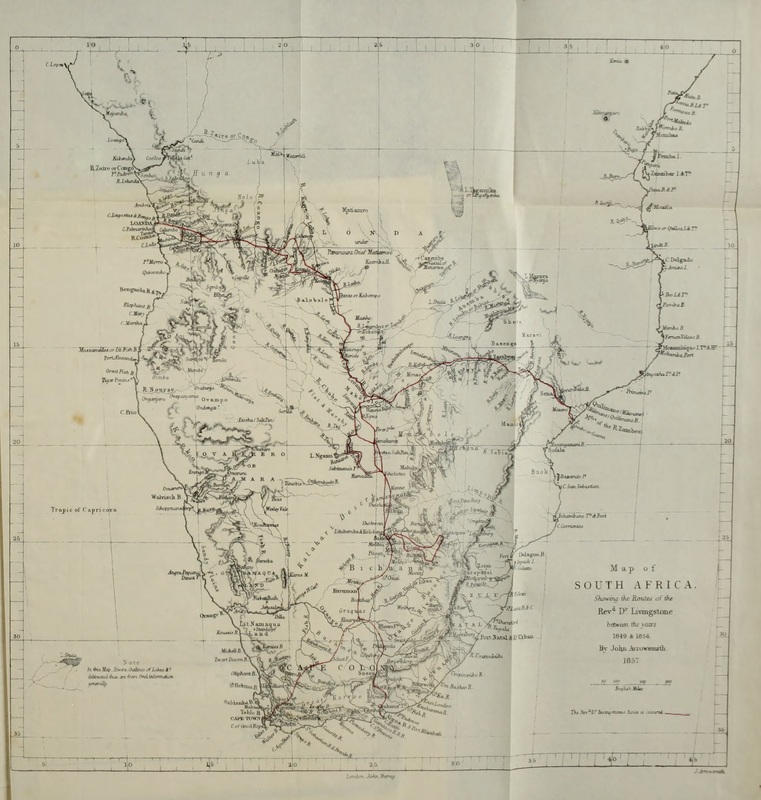 “Map of South Africa, Showing the Routes of the Revd. Dr. Livingstone between the years 1849 & 1856” by John Arrowsmith, published in Missionary Travels (Livingstone 1857:following 687). Public domain. Image courtesy of Internet Archive. This map traces Livingstone’s route during his transcontinental expedition (1852-56). Livingstone undertook this journey in collaboration with the Makololo people of south-central Africa, who provided him with supplies and logistical support. and outreach worksheets for school pupils aged 9-13. Over the coming months several additional features will be added to the edition, including illustrative images, a complete Glossary of Key Terms, and a Project History. As a result, we anticipate releasing the formal first edition later in 2019. “Livingstone’s Missionary Travels Manuscript” is the result of research and development over a six-year period, the longest time given to any edition currently published by Livingstone Online. Many individuals contributed to the project throughout its duration. We are grateful for the Murray family’s considerable interest and for Nigel Banks’s development of Livingstone Online which helped to make this project possible. Finally, the committed work of Dr Kate Simpson and Dr Stephen Hall, leaders of the scholarship support team, deserves special thanks (see Simpson’s blog post about her time on the project as MHRA Research Associate). 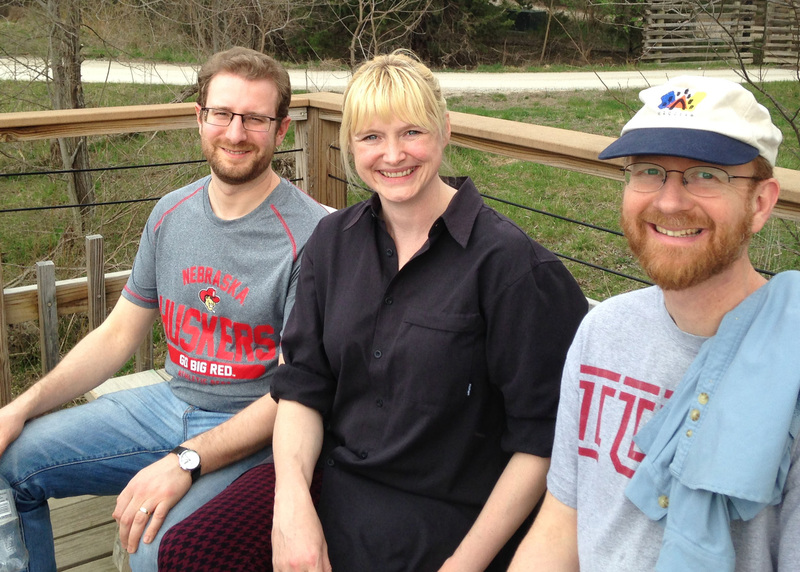 Members of the project team in Lincoln, Nebraska (2017): (from left) Justin D. Livingstone, Kate Simpson, and Adrian S. Wisnicki. Copyright Adrian S. Wisnicki. Creative Commons Attribution-NonCommercial 3.0 Unported.